You are currently browsing the Dublin Event Guide weblog archives for October, 2018. The fund raising to pay for the bills is going extremely bad this month. November is around the corner and the October bill still stands at EUR 165. That is super serious and I really really really need your help! Please, if you can support the Dublin Event Guide, do so! I am suggesting a very fair EUR 12 for the year, that’s just 23 cent per Dublin Event Guide Edition or just about 2 pints for 52 (!) editions of the Dublin Event Guide! That’s not much if you think about how much value the Dublin Event Guide brings you every week! Higher and lower donations are also appreciated! Every Euro counts! What I love about this quote is that it talks about quite small but consistent change. It doesn’t tell you to make MASSIVE shifts. Big changes are difficult, but small changes everyone can make. If you make these small changes consistently, you achieve a BIG change over time and that is MUCH better than to decide not to change “because it is too hard”. So make these small changes every day! Last week Noelle H, Tara R, Mairin M, Ann McP, Cornelia K and Meav NiM were so great to help with a very much needed donation. Thanks! Every cent counts and without all these contributions the Dublin Event Guide won’t continue. Jutta B-S, Jamie C, Leigh Ph, Irene D M, Michael D, Joan S, Melanie B, Anita W, Maria F, Moira dF, Arthur D, Catherine G, Clodagh C, Elaine K, Majella M, Ann M, Clodagh O’C, Claire R, Leigh Ph, Sarah L, Mark G, Erzsebet H, Isidro G, Karen A, Sean S, Melanie M, Zelie McG, Lindsay R, Thibaut D, Pia O, James B, Marguerite D, Shai C, Susan K, Agnieszka S-S, Alice K, Ieva B, Ruth L, Ana RT, Rita B, Sueanne O’H, Rosemary M, Darragh D, Lorraine S, Helena S, Carija I, Pat McK, Jennifer R, Sophie P-L, Jenny B, Catherine F, Stephen S, Juliana A Y, Caoimhe NiM, Damien B, Shane O’B, Melanie S, Audrey H, Catherine E, Michele McN, Susan B, Sharon K, Bill G, Malachy B, Catherine O’S, Paula R, Pamela A, Eleonora P, Thomas B, Karen K, Brendan M, Eric O’F, Gale G, Daniel LG, Mark G, Margo C, Joan S, Debbie C, Karen McG, Eric C, Irish Family Names, Tom McM, Aishling B, Ana RT, Eamonn McG, Silja P, Nicola R, Jacinta O’B, Siobhan B, Orla P, Sharon G, Isidro G, Carmel C, Roisin R, Mona R, Suzanne D, Tracey O’C, Jessica G, Barbara L, Frances D, Emmet R, Irene C, Eugene McG, Stuart N, Laurie F, Joan S, Mark C, Clodagh O’C, Grace L, Peter D, Mona O’R, Maria J, Ryan M, Sharon B, Gennadii N, Tadgh C, Niamh D, Austin M, Belinda B, Brendan D, Cathie S, Margaret P, Eric C, Gerard B, Gareth G, Aine G, Lisa B, Rita B, Brendan McC, Dave H, Sarah D, Jutta B-S, Martin McN, Iulia A, Brendan, Mitzi D’A, Shay, Aideen, Sharon J, Julie O’S, Deirdre W, Leigh P, Sandra L, George K, Anita C, Anna Z, Judith B, P, Liam B, Justin M, Ross M, Daniel LG, Susan F, John F, Melanie B, Mark G, Tadhg C, Scott P, Marile K, Ornaigh G, Sarah H, Cormac F, Eamonn U, Janet L, Gerard Ph, Gabriel K, Frances D, John K, Aislinn T, Barry M, Jaqueline B, Alice K, Paul R, Lorraine M, Susan K, Joan S, Lorna L, DB, David M, Mark R, Daire OC, Anne H, John F, Isidro G, Nora O’K, David O’K, Yvonne C, Aideen D, Lica B, Ayodele O, Noelle H, Tara R, Mairin M, Ann McP, Cornelia K, Meav NiM and Travel Agency “Project Travel” (www.project-travel.ie Ireland’s only Norway and Northern Lights Travel Experts), Arthur’s Pub (www.arthurspub.ie A classic Dublin old-style pub in 28 Thomas Street with a new and buzzing music venue that runs lots of events), Cycling Campaign (www.dublincycling.ie), www.cfcp.ie (The Centre for Creative Practices is the the only arts centre in Ireland dedicated to connecting, integrating and promoting immigrant, experimental and emerging artists among the local arts scene and audiences). National Harp Day on Saturday, a new Science Gallery exhibition and some Halloween events at the National Botanic Garden are my picks this week! Have a great weekend! Last week I read somewhere that there are now approx. 7,000 Electric Vehicles (EV) registered in Ireland. But the Irish government has committed to 20,000 on Irish roads by 2020 and 500,000 by 2030. :-O The 20,000 number doesn’t look reachable unless more is done to promote EVs. In 10 years from 2020 to 2030 a lot can happen, so it is impossible at the moment to make any guesses about the reachability of that BIG goal, but the next milestone is – based on current uptake – impossible to reach. You probably have never heard his name, but you definitely have heard about his work! Concert Promoter John Reynolds died suddenly at the age of just 52 during the week and he certainly left his footprints all over the cultural scene in Ireland. Not so much in the free event world, but very much so in the concert world. He founded the Electric Picnic festival and was heavily involved with Forbidden Fruit, All Together Now, Vinyl and he also ran the POD and Red Box clubs in Harcourt Street. 52 is MUCH too young to die and unfortunately the family is not shedding any light on what happened to him. RTE reported his death here. The Dockers and Demons Festival in the Irishtown/Ringsend/Docklands area will run from 27-31 October. There will be a Curious Cabaret, a Zombie Teen Disco, Freaky Funhouse, Seniors Halloween Monsters Ball, Fun Craft Workshops, local entertainment and historical tours. The festival concludes with the Dockers & Demons Parade and Street Party which takes place on Thorncastle Street from 18:30-21:30 on Halloween Night. Admission is free. The full list of events is here. The Dublin Marathon Expo, where all 20,000 participants need to collect their race number and timing chip will take place in the Main Hall of the RDS and admission is free. The main purpose of the event is to hand out the race number etc., but there are also a few stalls that sell and show running related equipment and nutritional items. Even if you are not taking part in the Marathon but are a runner at other events there might be something for you. Admission is free. Stokerland is a Victorian Fun Park for the whole family with street theatre, a performance tent, face painting, macabre thrills, and ghoulish games. There will also be a food village, story telling, theatre and fair ground rides. Stokerland is part of the Bram Stoker Festival and will take place on Saturday and Sunday. Come to the Gallery Shop for a free Halloween-themed drawing session and book signing with Don Conroy, artist and children’s author. Come to the Discovery Zone in the Natural Museum to meet a team of scientists from Geological Survey Ireland. Learn about Ireland’s geological past and even make your own fossil. Admission is free and no booking is required for this Drop-in Activity. A “Slow Art Tour – Mindfulness” will take place at the Chester Beatty Library. Mary Dowling will bring you on a thoughtful exploration of selected artworks from the Gift of a Lifetime exhibition. Make a mental connection with the material, share your observations with others or immerse yourself the space created there and then. Admission is free, but limited to the first 10 Participants. Meeting point is in the artium of the museum. An Intercultural Tour in Arabic Language with Community Ambassador Asmaa Ashour willt ake place. Admission is free. Meeting point is in the atrium of the museum. Admission is free to all of these events. The Arlington Hotel near O’Connell Bridge is inviting to a “Spooktacular Fancy Dress Halloween Party” with live bands. Admission is free. The best costume will win a travel voucher from a EUR 500 prize pot. Secret Cellar are running a Halloween acoustic gig in the Vintage Rooms at the Workman’s Club on Saturday. The line-up is Kevin Nolan, Jem Mitchell, Bayonets, Edwin T Wright. CoalTrain will play lues and Rock ‘n’ Roll in the Harbour Bar. Admission is free before 21:00 and is EUR 5 afterwards. Palmerstown House is running live gigs this Halloween Weekend. Sean O’B will play a gig in Whelan’s and support will be provided by Modernlove. On Saturday night / Sunday morning at 02:00, the clock will be put back by 1 hour to 01:00 to go back to Wintertime or GMT. While there is a good chance that the twice yearly clock changes will soon come to an end and we will probably stay on Summertime from 2021 (or possibly even before), there might be a few more before that. The autumn clock change means that you get an additional hour of sleep. That’s not a bad thing. When you wake up on Sunday morning, you should check though if the clock change worked. Smartphones and computers do NOT require you to change the time, they are smart enough to do that themselves. But analogue clocks do need you. If you are completely confused and don’t know anymore what the correct time is, just go to Google and type in “time now” and the current accurate time will be shown. On Sunday the 2018 version of the Dublin Marathon will happen again. Approx. 20,000 (!!!) participants will run, jog or walk the 42km. Start is in Fitzwilliam Street and Finish is at Merrion Square, but 42 km is a LOT, so to put that distance between the Start and Finish means that the Marathon will cover (and affect) a huge area of Dublin. The route map can be found here. There will be partial and total road closures all over Dublin and the full list is here. Participation is not free (and registration is long closed), but the runners do appreciate your support along the route. Cheer them on if you can! Sponsor of the Marathon in 2018 is SSE Airtricity. Thie event is all about Magical Plants in the Witch’s Garden. Join the coven to find out more about using garlic to ward off vampires, plants for potions and spells, poisonous plants and even some rarely seen invisible plants. The event is for children, an age is not specified.Admission seems to be free. It will take place on Sun 28 Oct at 11:00 and 11:30 / Mon 29 Oct 11:00 and 11:30 / Tue 30 Oct 11:00 and 11:30 and Wed 31 Oct 11:00 and 11:30. This is a Drop-in family workshop with Peter Donnelly, author and illustrator of ‘The President’s Glasses’. At this weekly drop-in workshop, children and their parents/guardians/carers are encouraged to work together on creative projects. Drop-in and stay for as long (or as little!) as you wish. The workshops are suitable for children of all ages, and take place in the Maples and Calder Creative Space in the Atrium. A Children’s book clinic in the National Gallery will help children to find the next exciting book to read. Create scary Halloween decorations full of ghoulish creepy crawlies and frightening monsters. This is a free drop-in craft activity for children (must be accompanied by an adult). The next concert will feature Miriam Roycroft on cello and Lance Coburn on piano. The Phoenix Park Visitor is is inviting to a Puppet Theatre show on Sunday. The show will happen at 13:30 and again at 15:00. Moon & Sixpence Puppet Theatre will perform “Jacqueleen’s adventures with the beanstalk”. Admission is free. The event information is in this PDF. The Ardagh 150th Anniversary Tour celebrates the 150th Anniversary of the finding of the Ardagh Chalice. Join this special tour of Treasury Exhibition exploring Ireland’s most famous and iconic object. Learn about the people of early medieval Ireland, the influence of the coming of Christianity to Ireland in the 5th century and how the Ardagh Chalice, among other fine metal objects, were made and designed. “From Barracks to Museum” is a tour to learn about the history of Collins Barracks, from the 1700s to the present day and its transition from Barracks to Museum, taking in some of the highlights from the Museum’s military history or decorative arts exhibitions. Admission is free, places will be allocated on a first-come first served basis 15 minutes before the tour starts. Suitable for all ages. This will be followed by The Karaoke Club and Djs upstairs playing House & Disco and Alternative & Indie. Admission is free and there will be prizes for best costumes. The Creators, a band around Rory Wilson (vocals+ harmonica) a dn wtih Conor Brady (The Blades), Rob Malone (Lir/David Gray) and former Frame Johnny Boyle, will play a gig in Sin E. They will be supported by Leila Jane. Admission is free before 21:00 and EUR 5 afterwards. Cover Band “Prom Night” will play a gig with pop, rock and soul classics at The Back Page. The SoulJackers will play Soul and Lounge music in the Harbour Bar. The October Bank Holiday is the last Bank Holiday Mondays this year. The next bank holiday will be at Christmas (25+26 Dec) and then again on 01 Jan. For the next Bank Holiday Monday you will have to wait until March 2019 when 18 March is the replacement bank holiday for St. Patrick’s Day. which will be on a Sunday next year. AS far as events are concerned, the October Bank Holiday is usually a bit of a disappointment: Not much is happening on that day! Shops are open, so lots of people do some shopping on the bank holiday. Regular events might or might not happen. Where I know that they are definitely not taking place, I have taken the regular event out of this list, but I wouldn’t know in all cases, so you better check. Admission is free on first come first served basis, Dracula’s Disco is an outdoors event under the big umbrellas on Meeting House Square. A Pumpkin Carving event with Dale Treadwell for the whole family will happen. It will start with a fun talk about Ghosts, Ghouls and Witches and will be followed by carving of pumpkins in the Courtyard. There will be prizes for the best costume. Admission is free. The event is listed in this PDF. The Dublin Visitor Centre is running a Halloween Party for kids and their parents with story telling, games, disco, food and art workshop. Admission is free but booking is requried via the website below. The Bram Stoker Festival is bringing again the a parade by spectacle company Macnas from Galway to the streets of Dublin. The theme is “Out of the Wild Sky” and it is described as “a haunting and hair-raising parade of otherworldly magic”. Macnas are the people that create parades with huge figures, lots of fire and sometimes also music. You might have seen some of their “floats” at St. Patrick’s Parades or other Halloween or New Year’s eve parades. The parade route goes from Moore Street, along Henry Street, then Mary Street, into Capel Street, then Little Brittain Street, Halston Street and it ends ar St. Michan’s Street/Mary’s Lane (near the Fruit Market). Not overly long, all on the North side, So the best place (but it could be very busy) might be in Henry Street, Mary Street or Capel Street. Arrive early!! You should be at your spot by 18:30 If the popular areas are too full, consider walking towards the END of the route. The Bank Holiday gig in the Harbour Bar is with “Dubby Electronica” band “Grouse”. Find some more detail via the link below. This is a one-day symposium about the contemporary Irish horror film organised by Trinity’s School of Creative Arts in association with DCU and the Irish Film Institute. The Smyposium will feature speakers Ruth Barton (TCD), Roddy Flynn (DCU), Loretta Goff (UCC), Caitlin Harrigan (MU), Jacob Martin (TCD), Harvey O’Brien (UCD), Emma Radley (UCD). The symposium will also feature an industry panel and will conclude with a special screening of The Devil’s Doorway (Aislinn Clarke, 2018) at the Irish Film Institute. Admission is free, but booking is required (before 28 Nov!) via the link below, where you will also find the full programme. This Study Morning will discuss themes around the “Furtive Tears” exhibition of work by Niamh McCann which explores the dynamic relationship between audience, object and mode of display. Speakers will be artist Niamh McCann and author Darran Anderson. The Seamus Heaney: Listen Now Again exhibition invites to a few mid-term events for children. All events are free, but booking is required via heaneyexhibition@nli.ie because space is limited. Listen to a collection of Irish stories from Marie Heaney’s illustrated book ‘The Names Upon the Harp’. The legends will entrance children and connect them with Seamus Heaney’s poetry. This is an origami lesson to create interesting shapes using colourful paper inspired by Maser’s origami masterpiece featured in the exhibition with a special focus on Seamus Heaney’s poem ‘The Flight Path’ where a boy is mesmerized by his father’s ability to masterfully fold a piece of paper into a boat. Join Aoileann Ní Bhroin and Kathryn McCance for a rainstick-making lesson. Participants will design and create their own rainstick instrument, as inspired by Seamus Heaney’s poem ‘The Rainstick’. In Norse mythology, Huginn and Muninn are a pair of ravens that fly all over the world and bring back information for the Viking god Odin. Discover more about the beliefs of the Vikings and their celebrations at this time of year and make your own spooky raven mask to take home. Halloween costumes are welcome. Admission is free. Located in the Learning Resource Room on 1st floor. Suitable from age 8+. Admission is free. Seats will be allocated on a first come, first served basis. The Pop-up talk “Demosthenes on the Seashore”with Sasha Smith will take place in front of Eugène Delacroix’s painting Demosthenes on the Seashore, 1859 in Room 1 (Millennium Wing). The Swan Shopping Centre in Rathmines is running a Halloween party for kids on Tuesday and Wednesday. 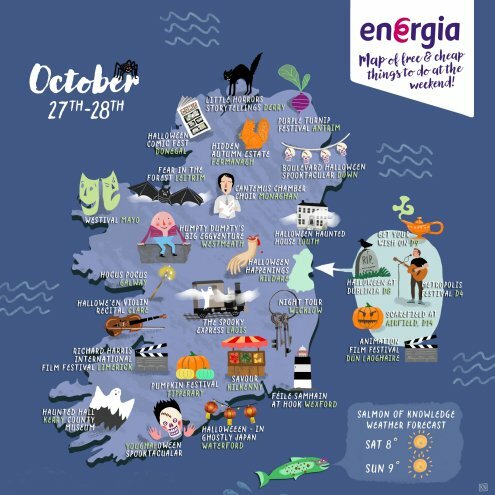 There will be Tricks & Treats, a Magician, a Mad Scientist, music, Pumpkin carving in Fallon & Byrne and story telling in Dubray Books. There will be Halloween events in a variety of libraries in Dublin and the website below will provide the details. Some of the locations are Ballyfermot Library, Dolphin’s Barn Library, Donaghmeade Library, Walkinstown Library. The talk “Rare and Wild plants of Ireland” will take place in the National Botanic Garden. The Halloween Festival on Smithfield Plaza will come with a 300m zip line, a 50m Bungee Jump, a ‘Cirque Du Freak’ Scare Tent, Climbing Wall and ‘Lost Souls’ Parade. (The ‘Cirque Du Freak’ Scare Tent will be open at 16:30-17:30 / 17:45-18:45 and 19:00-19:30. ) In addition there will be the Dublin Circus Project, Giant Screen Playstation Tournament, Food Stalls, Art Workshops, Bungee Trampolines, Giant Jurassic Bouncy Castle, Face Painting and more. On the Main Stage SingStar Finals, Costume Parade, Drummers, Djs and MC Andrew Stanley and some Special Guests will perform. Admission is free. And keep in mind that it is an alcohol-free event! The Otherworld Festival in Ballymun starts with a parade from the Vir gin Mary’s School in Shangan Road at 16:45. And the festival kicks off on the plaza at 18:00. There will be a Circus, Funfair Rides, an Arts & Crafts Tent, Storytelling Workshops, Tarot Card Reading and Main Stage Entertainment. Spring Break will be one of the bands performing. A fireworks display at 20:30 will be the fitting end. The Festival of Fire in Swords will take place in Swords Town Park, BEHIND the Castle. It will start at 17:30 and I think there might be a fireworks as well as in Blanchardstown and Balbriggan. Admission is free. Come in your costume and bring a torch. The Festival of Fire will take place on Halloween in Blanchardstown. The event starts with entertainment on the main stage from 18:00 and at 19:00 (sharp) a Fireworks Display will follow. You are asked to dress up and bring a torch. The Finglas Fright Night Halloween Festival will take place at the Civic Centre on Wednesday. This year the entertainment will include a Path of Misery, Colm Dawson’s Magic Show and Fancy Dress competition. There will also be Fairground attractions including, a Merry go Round, Kiddies Roller Coaster, Teenage Terminator, Chair-o-Planes and Obstacle Courses. A live interactive art exhibition will also take place. Music will be provided by bands from the Finglas Youth Resource Centre and ABBA Girls. The night will conclude with a Fireworks display. Please note: large bags and backpacks will not be allowed, only a small bag not bigger than A4 will be permitted into the venue. This is an alcohol and drug free event. The Festival of Fire in Balbriggan will bring you a Fireworks which can be seen from the beach at Balbriggan Harbour. Come in costume and bring a torch, Admission is free. The Tour “Imperial Dragon Robes” will look behind the magnificent silk embroidery and explore the myths, magic and meaning of some of these ancient symbols of beliefs, codes and values. The talk “Lives, legacies and legends of the Burren” seems to be a free event, but I couldn’t find any definite confirmation for it on their events page. It ir organised by the Burrenbeo Trust. At the next 1stFridayBrekkie Eamonn Costello, Co-Founder and CEO of patientMpower will talk about digital therapeutics in Lung & Kidney disease and about the challenges and opportunities he faces in his job. Admission is free, but registration is requied via the link below. First Fridays for Startups is a platform where members of the startup ecosystem can come together on a regular basis, enabling them to learn, connect and grow. There will be mentoring slots and NORMALLY there is also a talk/keynote. But this month renovations are ongoing in the CHQ Building, so the only event is the Mentoring from 10:00-12:00. More details on the website below. Admission is free. The Seal of Approval with Seal Rescue Ireland is a Drop-in Activity in the Natural History Museum. Meet the team from Seal Rescue Ireland and learn all about the important work they do to protect our native seals. Visit the touch table in the Discovery Zone to see real seal skulls, pelts and parasites. Go upstairs to the Mammals of the World exhibition to complete a fun seal-themed activity, and don’t forget to visit the different seals and sea lions on display at the Museum too. Admission is free. Suitable for families and all ages. Women Artists at the Hugh Lane Gallery will be the focus of this month’s First Friday Culture Club. On Saturday a Teens Lab with the theme “Exploration of 3D printing: Curating an Exhibition” will take place and is suitable for 15 – 17 year olds. Admission is free, but booking is required via the link below. At the time of writing there were still some places available, but hurry so that you don’t miss out! You are invited to come to this pot-luck party, meet local food producers and find out how food connects us all! Join Young Friends of the Earth Ireland and Foodture on Friday 02 Nov for an evening of discussion, entertainment and eating. Stories and food will be shared and you will explore how we can move away from industrial agriculture to a more local, inclusive and fairer food future. This is a pot-luck event so bring your favourite dish to share. “Bring out the Chimp” will play Funk Soul Fusion at this gig. 8-piece Americana/Roots/Country-Folk/Urban Bluegrass band “Police Dog Hogan” from the UK will be in Bray for a gig. Tongue in Chic will play a gig in the Grand Social on Saturday. The walks in October are on 07+13+21+27 Oct and for November a walk on 04 Nov has been announced. More might be announced. Last week I was in San Diego for 10 days for a training course (and a couple of days holidays added to the end). I had originally planned to use day passes on public transport to get around, but it turned out that the websites painted a nicer picture of the public transport system than it was in reality and it started at the airport when the “promised” facility to buy their equivalent of a LEAP card could just not be found. So right after arrival we had to change our plans and the options were either Taxi or Uber. The distance from the airport was about 8 miles. With a taxi that would be $24, with Uber it was $16. Not a bad start! And it just continued like that! We did about 10 Uber Trips altogether and had not a single bad experience. All drivers were extremely friendly, some were chatty, some not. All drove well and responsible and all had other jobs and only did a few hours of Uber driving per day or per week. Not once did we have to wait longer than 4 minutes until we were picked up and not once did a driver take “the scenic route” or tried to use any other trick to increase the fare (because they can’t!!). If you don’t know how Uber operates let me explain it briefly: Uber drivers are private car owners who only need their mobile phone to become an Uber driver. When you book an Uber trip, the customer specifies the start and end point on an app and is told the full price in advance (the driver can’t change it and there are NO surcharges). The app for the driver is a SatNav system and tells the driver exactly how to get to the destination, so the driver just needs to follow the instructions. At the end of the trip you don’t pay by cash or card, instead the app sorts out all payments from your credit card to the driver. So you thank the driver and leave the car. A completely cashless system. It is just brilliant! BUT we don’t have it and if the National Transport Authority (NTA) is not reigned in soon, they will not allow us to have Uber. Why? Because they are protecting the overpriced and regulated Taxi business. Taxis are outdated and Taxi regulation is harming, not helping customers. You might say/think that we have Uber in Ireland, but it is a bastardised version of the proper Uber. In Ireland only licensed Taxi drivers are allowed to transport passengers for money, so Uber is just the middle man that connects you with a taxi driver via the app. It has some features of the proper Uber system because you make the contact by app, but the app doesn’t tell you what the price will be and the price is NO different than the normal taxi price. So, Uber in Ireland is not Uber and that is all thanks to the National Transport Authority (NTA).